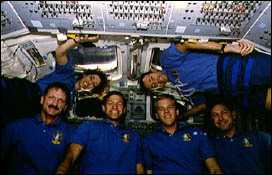 On the Space Shuttle Atlantis' flight deck, the six crew members pose for the traditional in-flight crew portrait. They include, left to right in lower frame, astronauts Joseph R. Tanner, mission specialist; Donald R. McMonagle, mission commander; Scott E. Parazynski, mission specialist; and Curtis L. Brown, pilot. Floating at top frame are Ellen Ochoa, payload commander; and Jean-Francois Clervoy, mission specialist, representing the European Space Agency (ESA). 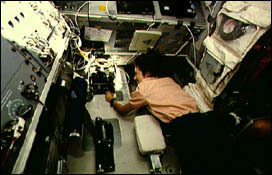 On the Space Shuttle Atlantis' aft flight deck, astronaut Ellen Ochoa, payload commander, supports the Atmospheric Trace Molecule Spectroscopy (ATMOS) experiment with a checkout of a pair of 8mm video tape recorders. Note Atlantis' addition of the lower body restraint device (left) used to support crew members spending long periods of stationary time at the aft flight deck. One of my other jobs on the two flights that Ive been on is to operate the robotic arm that we have and maybe youve seen that on TV, too. We have a fifty foot long arm that we can take up on the Shuttle and we used it to display and retrieve a science satellite. This arm is a lot like your own arm. It has a wrist, joint. It has an elbow joint, and it has a shoulder joint. And we can operate it in a variety of ways. The most common way is that we have two hand controllers -- kind of like a video game where were trained to operate the arm to move all the joints at once so we can move from one position to any other position by moving these two hand controls. We can also operate it just joint by joint. So, if we want to move just the wrist joint or just the shoulder joint, we have a way of doing that. Masses of clouds over the Atlantic Ocean serve as the backdrop for this close-up scene of the Cryogenic Infrared Spectrometers and Telescopes for the Atmosphere (CRISTA), attached to the Shuttle Pallet System (SPAS). 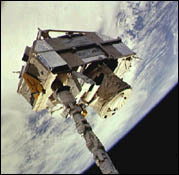 CRISTA-SPAS was in the grasp of the Space Shuttle Atlantis Remote Manipulator System (RMS) arm. The crew deployed the Crista-SPAS on November 4, 1994 and the tandem remained in free-flight until November 12, 1994 when it was retrieved by the Canadian-built RMS, controlled by payload commander Ellen Ochoa.